Last Saturday, I was honored to present for the joint Seattle Food Allergy Consortium (SEAFAC) and Washington Food Allergy Eczema Asthma Support Team (WA FEAST) conference in Seattle, Washington. A huge shout-out to Kelly Morgan for doing an amazing job at organizing the afternoon sessions! I hope to update with more soon. I learned about several research studies currently recruiting participants in the Pacific Northwest. This could very much apply to my local crowd in Oregon! Perhaps one of the most thought-provoking sessions pertained to anxiety and food allergies. It isn't an easy discussion by any means, but very necessary given its prevalence. My gut feeling is that this issue has been ignored for far too long and very much needs to be raised to the forefront. Stay tuned! 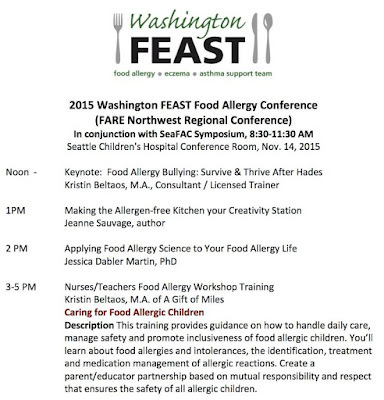 Food Allergy Conference in Seattle Nov. 14 - I'm Going! For those of you in the Pacific Northwest, a wonderful conference is happening this weekend in Seattle! It is a joint event between the Seattle Food Allergy Consortium (SEAFAC) in the morning and Washington's food allergy support group - Food Allergy Eczema Asthma Support Team (FEAST) - in the afternoon. It isn't too late to register. 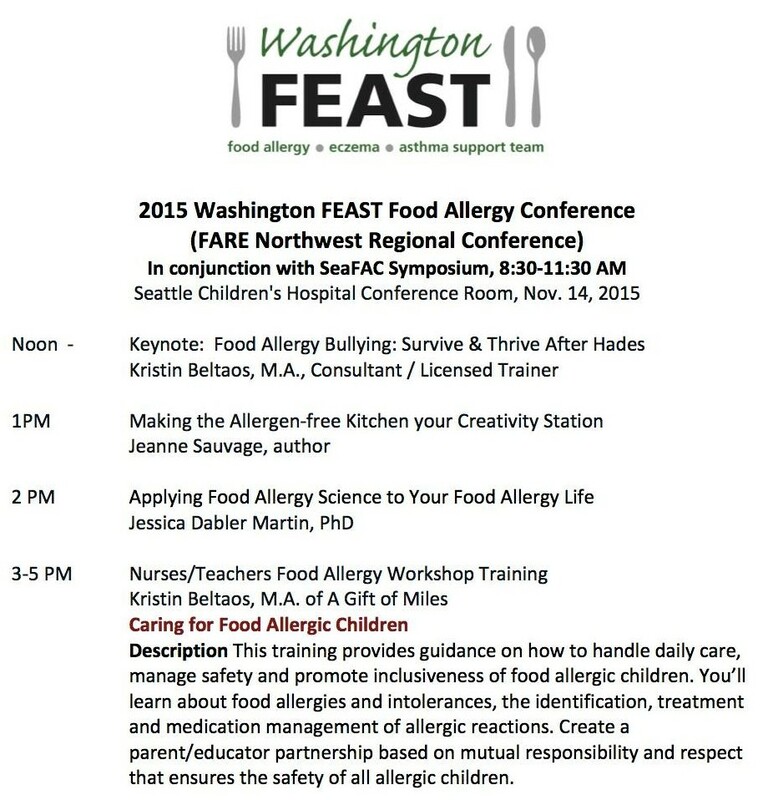 For my part, I'm excited to present for FEAST on how you can apply food allergy science to your food allergy life! My hope is that everyone (from newly diagnosed to dealing with food allergies for years) can come away with a better understanding of the science, its presentation in various media outlets, and practical tools for evaluating and applying science to everyday life. Sure to make a cameo are various studies from LEAP to your dishwasher's role (or not?) in allergy. I'll also mention how science can be used to advocate for yourself or your child and beyond. SEAFAC is a group of world-class food allergy physicians and researchers in Seattle. I'm excited to hear the latest research findings and also hear about clinical studies happening locally! 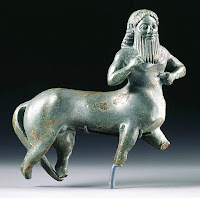 My talk in the afternoon should dovetail nicely with SEAFAC's presentations. Details on their morning symposium. 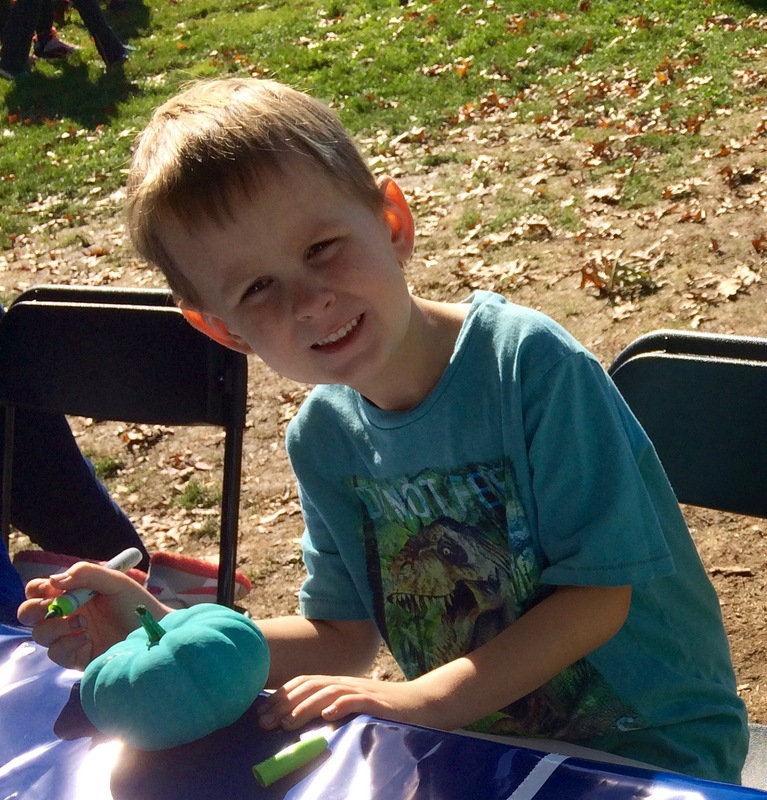 WAFEAST is a great local support group for those who are dealing with any of a triad of allergic disorders, which includes food allergy. I'm looking forward to meeting new friends to the north! The agenda features a stellar line-up of individuals, and I'm truly honored to be a part of this group. I know that I will learn a lot this weekend and I hope that you do, too! Huge thanks to Kelly Morgan and all other volunteers making this happen. PS - Huge shout-out to all going to the Food Allergy Blogger's Conference in Denver this weekend. I will miss you! 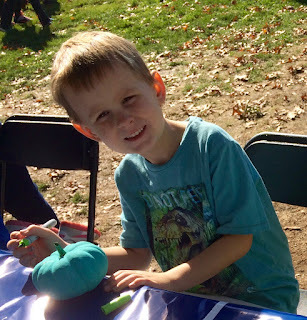 "JR" decorating his teal pumpkin at the Portland Food Allergy Research & Education Walk. Some people in the world have allergies. I have allergies also. My Mom and me are talking about allergies at Halloween. 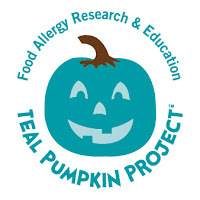 We should have teal pumpkins because teal is the color for food allergies. Trick-or-treating scares me a little bit because I might get an allergy. We need to be careful about the food. I still like trick-or-treating because I can trade the food that I’m allergic to. Every Halloween, we put the teal pumpkin up. The teal pumpkin means that our house has treats that are not food. They are little toys for kids who have allergies so they don’t have to trade the food! I feel very happy to have kids not have allergies. So this Halloween will you put up a teal pumpkin? For more resources and to take the teal pumpkin pledge, please see Food Allergy Research and Education! You can take the "pledge" and also print off teal pumpkin flyers for your door to let trick-or-treaters know you have non-food "treats" available. Myths abound when it comes to food allergies - no doubt about it. Even worse is when the popular media feeds the myth machine. Science journalism is tough because the work needs to be readable, factually accurate, and give non-scientist readers a sense of its significance and potential impact without over- or under-selling the complicated science itself. In other words, science writers translate what seems like a whole other language (academic journals) into something average human beings can understand and appreciate. When done well, science journalism/writing is a work of beauty. Some days, it feels about as rare as winning a Pulitzer Prize. Most science writers are knowledgeable about science, but are not scientists themselves. Mistakes happen, and scientists endlessly gripe about how the media seem to get it wrong more than they get it right. Scientists who also happen to write for the popular media are a rare, but powerful voice. I love the branding of The Conversation - academic rigor, journalistic flair - because I want to believe it. Is this finally a media outlet that can marry those two worlds? I'm now skeptical after reading "The myth of flying peanuts: not so deadly after all." I expected so much more from author, Tim Spector, who has both serious science and writing credentials. You don't get to be a professor at a well-known institution by making unsupported claims in your peer-reviewed journal articles. Why should it be any different in the popular media? Those rare, mythical Centaurian-like creatures are in a powerful position to influence change for the better in the media. Unfortunately, they are also in a position to do incredible harm when they appeal to their baser media flair side. Scientists shouldn't get to take a vacation when they don't have the threat of peer-review. I wish we lived in a world where regardless of a person's credentials, their work could be judged by the merit of their arguments. We don't live in that world. Appeal to authority speaks loudly because people just don't have the time or energy to vet everything for themselves. I've vetted "The myth of flying peanuts: not so deadly after all" for you at Asthma Allergies Children in the following piece - “Rigor” Mortis: Post Mortem on an Airborne Allergy Article. A big thank you to editor, Henry Ehrlich. What's quoted in the media isn't always what it seems. Unfortunately, I was reminded of this because of a misquote involving me that reared its ugly head after googling "Jessica Martin food allergy." (Always good to occasionally google yourself to make sure all is good with your public, digital self). The good news? The Food Allergy Sleuth blog is the top google hit (yay! I'm #1)! The bad news? Discovering a misquote floating on the internet from my foray into being the science interviewee (at least it was on page 2 since most people don't go beyond the first page, right? RIGHT?!). In the words of the infamous Homer, "Doh!"